Following the Reggiane Re 2000, in 1941 there appeared the Re.2001 Falco II with a 783-kW (1,050-hp) Daimler-Benz DB 601A-1 inline, redesigned canopy and revised wing. After two prototypes had been completed in 1940 with German-built DB 601A-1s, the fighter was ordered into production as the Re 2001 Falco II. A total of 236 were built (including prototypes and 10 pre-production aircraft), in various sub-series, major versions being the Serie I (100 built), with two 12.7-mm (0.5in) Breda-SAFAT machine-guns over the engine; the Re2001CN (Caccia Notturna: night fighter) Serie II and III with an additional 7.7-mm (0.303-in) gun in each wing or two German 20-mm (0.79-in) MG 151 cannon in underwing fairings; and the Re 2001CN Serie IV, which could carry an under-fuselage 640-kg (1410- lb) bomb or a drop-tank. Various experimental models of the Re2001 included a torpedo-carrying fighter conversion (Re 2001G); an antitank conversion (Re 2001M; a prototype conversion with flush-mounted leading-edge wing radiators (Re 2001bis); two Serie Is converted for catapult-launching trials; and a testbed for the Isotta-Fraschini Delta RC 16148 engine. Production Serie I Re 2001s made their operational debut in attacks on Malta in the early summer of 1942, with subsequent production models following them into service later that year. Thirty-nine Serie I aircraft were adapted as Re 2001CBs, able to carry a 640-kg (1410-lb) bomb or torpedo, and a further 12 as land-based carrier trainers, fitted with arrester gear. The most widely used version of all was the Re 2001CN (50 Serie II and 74 Serie III/IV), which from 1943 served with five Gruppi of the Regia Aeronautica as a defensive night fighter in central and northern Italy. But, by the armistice only 21 Falco IIs remained serviceable, of which eight were used subsequently by the Italian co-belligerent air force. The type was used in a large development programme with other engines, and the total of 237 aircraft included 224 production aircraft in two fighter, one fighter-bomber and one night-fighter series. There followed 227 Re.2002 Ariete (ram) fighter-bombers with the 880-kW (1,180-hp) Piaggio P.XIX RC 45 radial, and finally 37 Re.2005 Sagittario (Archer) fighters. The Re.2002 Ariete (Ram) fighter-bombers with the Regia Aeronautica, these being powered by the 876kW Piaggio P.XIX RC 45 radial engine mounted in a slightly lengthened and strengthened fuselage. The type first saw operational service in 1942, suffering heavy losses while contesting the Allied landings on Sicily. 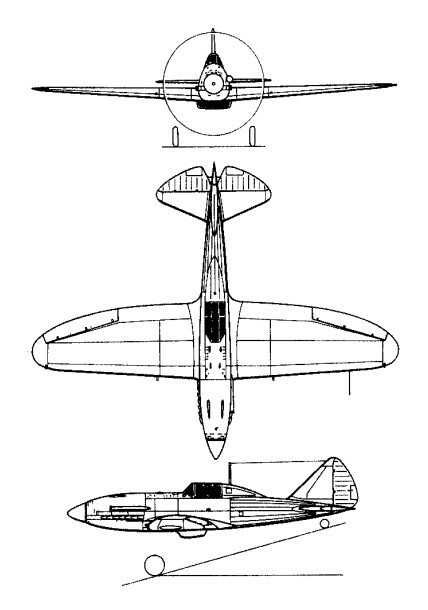 The Re.2005 Sagittario (Archer) had the same general configuration as its predecessors. However, its design incorporated considerable structural redesign, and refined landing gear, and the type reverted to the inline engine. First flown in September 1942 with a Daimler-Benz DB 605A-1, the Re.2005 led to a production model, of which deliveries began in 1943, with a licence-built version of this engine, the Fiat RA.1050 RC 58 Tifone. Only 48 had been delivered before finalisation of the armistice with the Allies, these aircraft fighting in the defence of Naples, Rome and Sicily, the survivors battling above Berlin. Engine 1 x Daimler-Benz DB 601A-1 / Alfa Romeo RA. 1000 RC.41-1a Monsonie, 783-kW (1,050-hp). Span: 11 m (36ft 1.75in). Length: 8.36 m (27 ft 5.25in). Gross weight. 3280 kg (7230 lb). Max speed: 542 kph (337 mph). Engine: l x Fiat RA.1050 RC 58 Tifone, 1100kW (1,475hp). Span: 11m (36ft 1 in). Length: 8.73m (28 ft 7.75 in). Normal TO weight: 3610 kg (7,960 lb). Max speed: 421 mph at 6,560 ft.